After our wedding, we went away to Nova Scotia and Prince Edward Island. I’ve been to Halifax and the Annapolis Valley once before, in April 2004, but I’ve never been to Cape Breton (which has become one of my favourite places in Canada), or PEI. It was a wonderful trip. We drove the Cabot Trail, hiked several trails in Cape Breton Highlands National Park, enjoyed great meals featuring local seafood, visited restored historic sites such as the Fortress of Louisbourg, and spent some time wandering around Halifax and Charlottetown. I’ll write more on those adventures later. Driving through Nova Scotia on the way to Cape Breton, you must pass through Pictou County on Highway 104, part of the Trans-Canada Highway. Most travelers pass through, or stop off the highway for gas or food. But the region has an interesting history, and we visited two historic sites there which are off most tourists’ radar. 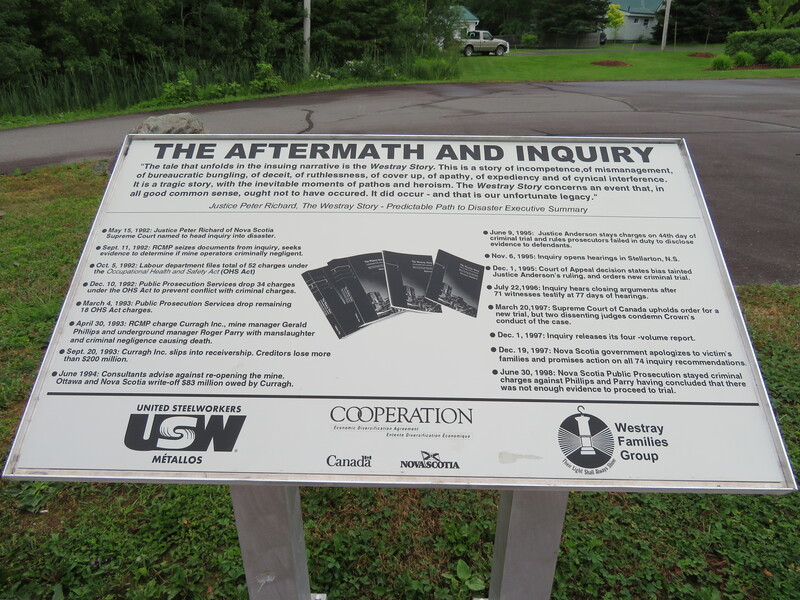 Once an industrial powerhouse, settlements such as New Glasgow, Stellarton, and Trenton have been hit by the closures in the steel industry and in coal mining. Trenton had a large steel mill; the TrentonWorks plant produced rail cars until 2007. Coal mining was also important to both northern Nova Scotia and in Cape Breton, but today, only one surface coal mine remains in the province near Stellarton. Today, Stellarton might be most known as the hometown of and headquarters for the Sobeys supermarket chain and its parent company, Empire Corp. The town of Pictou was known for its shipbuilding industry. New Glasgow, which we visited, is the largest community in Pictou County, and the regional centre for central Nova Scotia. We stayed in New Glasgow overnight, as we were to take the Northumberland Ferry to PEI early the next morning. In 1947, Viola Desmond, a successful Black entrepreneur, was removed by police from the Roseland Theatre for refusing to sit in the upper segregated seating area, but in the ‘whites only’ section. She was charged and convicted for tax evasion – the one cent difference in the provincial amusement tax between the ticket she was sold and the lower level seating. Despite this injustice, the apology and pardon from the Nova Scotia government didn’t come until 2010. That year, a plaque was unveiled in New Glasgow. Since then, there has been more recognition of this injustice and of Desmond’s importance — a new ferry was named for her in Halifax, and she will appear on the next issue of the $10 bank note. Today, the Roseland Theatre is closed (the theatre later became a club). I found the building (which is being renovated, and the marquee removed), but I had trouble finding the plaque. I found out it was located two blocks away from the theatre building, next to the public library. Tragically, eleven bodies remain underground. 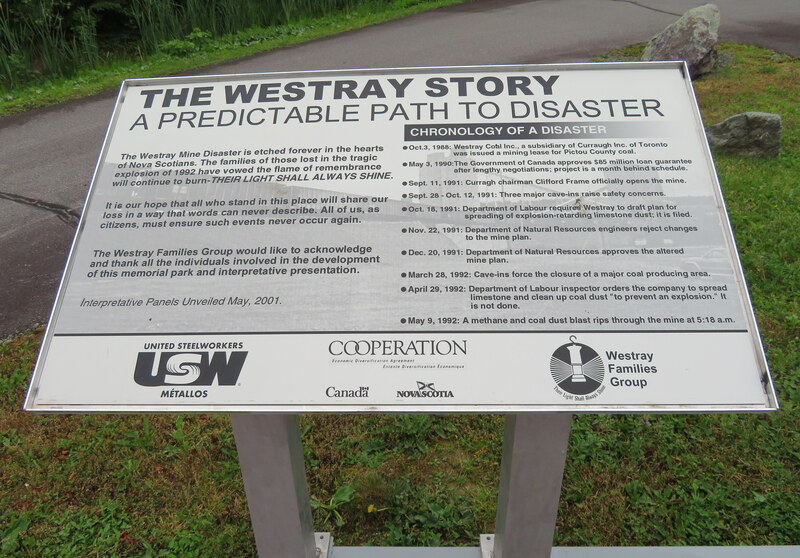 The mining company ignored unsafe working conditions, and the government was complicit in knowing about the problems but not forcing changes — the Westray mine promised jobs, not only in the mine, but in other local industries, such as TrentonWorks, which was contracted to supply rail cars for shipping coal to a nearby power generation station. The mine had lots of support at all three levels of government; this likely contributed to pressure to keep it open despite serious safety concerns. Furthermore, criminal proceedings against the company and its management were botched. 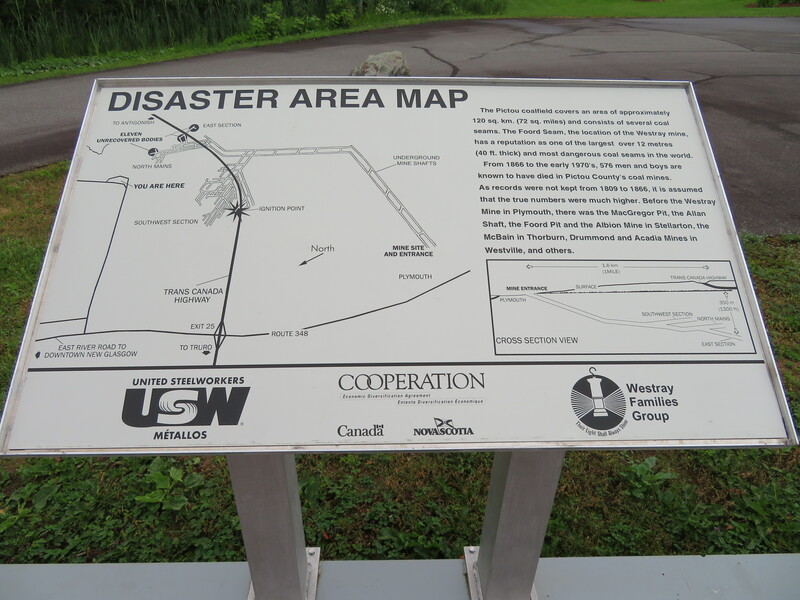 Though the main Westray Mine site and shaft were located at Plymouth, to the south of New Glasgow, the explosion took place north of Highway 104, within the city limits. Their Light Shall Always Shine Memorial Park is located close to the site. 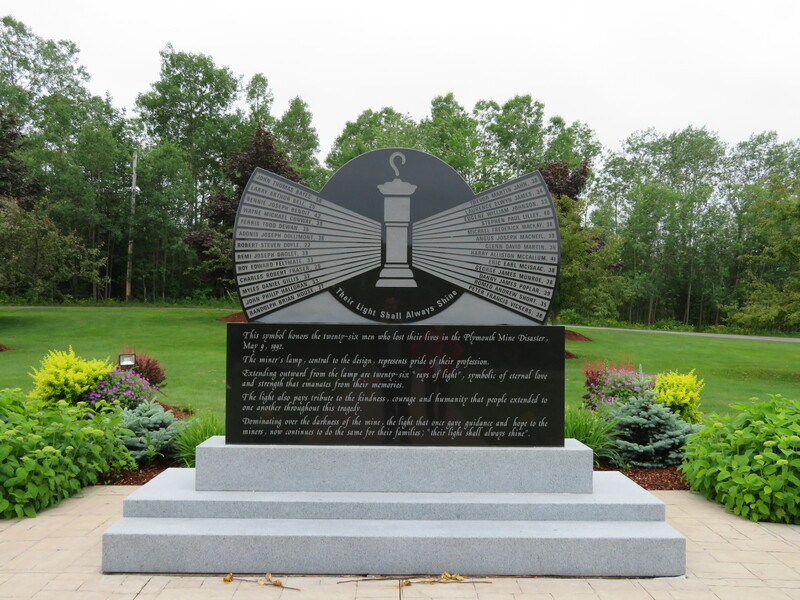 Besides a garden and a monument with all sixteen men’s names, there are several interpretative plaques on the history of the Westray Mine, the explosion, and the aftermath. 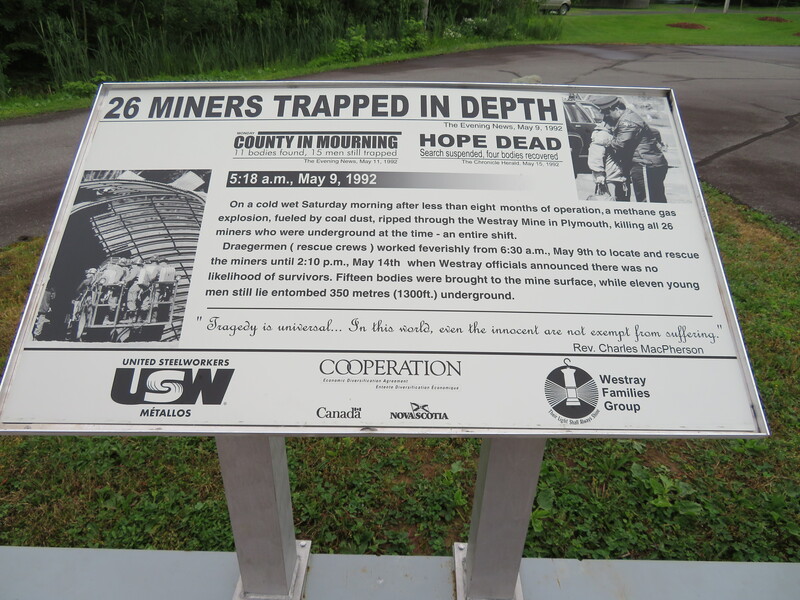 This entry was posted in Canada, History, Travels and tagged History, New Glasgow, Nova Scotia, Travels, Viola Desmond, Westray Mine. Bookmark the permalink.